Hi loves! How has everyone been so far? This week has been moving quite great. Work environment has been going smooth. I can't believe I just spoke about my weekend in the prior post and now, another weekend is almost here. I miss having everyone around. The last time we were all together was in December in Nigera. Remembering my visit to Nigeria and how every night was always fun and loud. We will all sit in the living room with tons of "Suya" (like spicy grilled meat on the stick or cut up in chucks) and chatting about everything or watching movies. Love family time! On the other hand, it would have been nice to be in London for the Olympics, but I will definitely be cheering and watching swimmng, gymnastics and track from my living room. Do you have a specifc interest in any sports that will be showing during the 2012 London Olympics? In high school, I was such a huge sports girl. I ran track and played soccer. I still enjoy watching soccer. What sports did you do or still do? this is so good! is it meant to be worn together or did you put it together. either way, it's PERFECT! I ran track all my life, so I will def be tuned in for Track....400m, 400 hurdles and the 4x4 are my fav events! Have a great time in Canada! Beautiful look!Love everything about it! This set is just perfect! I'm in love with this pattern compination and your jewellery! oh i'm so in love with your outfit. dear I love your set:)! wow totally love this outfit!!! Oh my gosh, your neckalce your shoes! I could not love this outfit more if I tried. I was so shocked when I scrolled down to see you didn't have 100's of comments! Your outfits are gorgeous! I love your accessories, they are great. Keep on the great work and stay blessed! Such a chic set, love it. You look so pretty dearie. Love this look! Haha love the shot of you and the hubby! I love that blazer! It's so beautiful! Love this outfit, very well put together as always. And that necklace, definitely makes a statement. Not really a sporty person, so I do more cheering than participation. Will be watching the olympics track and gymnastics from my living room as well. Its the couch for me I'm afraid. Never played any sport. Lovely jacket. I've been buying a lot of paisley this season. Love your blog. Love the clashing of prints with this outfit, it looks amazeballs!!! Girl that suit is simply amazing! Love the prints and so mad they are sold out! Cute and stylish per usual!!! That necklace is amazing! Love the look. Hi Stella.thnks so much for you sweet comment on my blog! anway I checked your blog and love it! such a marvelous style you have!! ur blazer, jewelry, nails!! <333 it! Wow! Love how you've style this outfit! If it were me, I probably would have kept everything else basic and had a statement blazer but your version looks amazing too! You could not have pushed me further down the hole of lust like you have with this outfit! Love the look !! 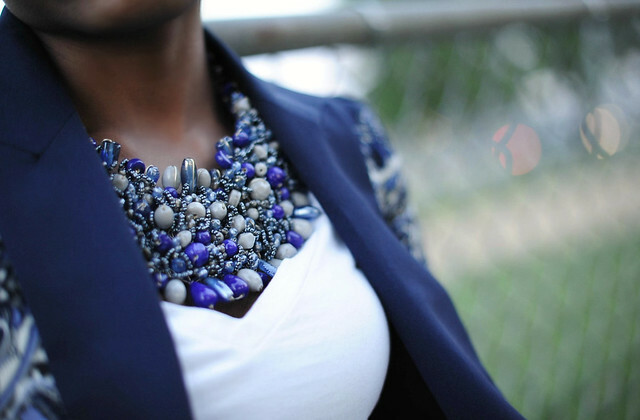 And i need this necklace in my life. your statement neckless is fab. What a beautiful necklace and bracelets! I'm loving your style so Im' following you now! hope you follow back if you liked my blog :) Take care! This is a really cute look!! too bad both sold out..